Epicenter and shaking intensity (contours) for Sunday night's earthquake. A small town in Oklahoma was once again shaken Sunday night by an earthquake—part of the Sooner State’s new seismic reality. The state's normal geological quiet has been interrupted by the injection of wastewater into deep disposal wells. Most of that water comes from conventional (rather than fracked) oil and gas extraction, as contaminated water comes up with the oil. Injecting the wastewater back down into deep, salty aquifers is an inexpensive way to deal with it, but the practice has triggered earthquakes on old faults underlying north-central Oklahoma. 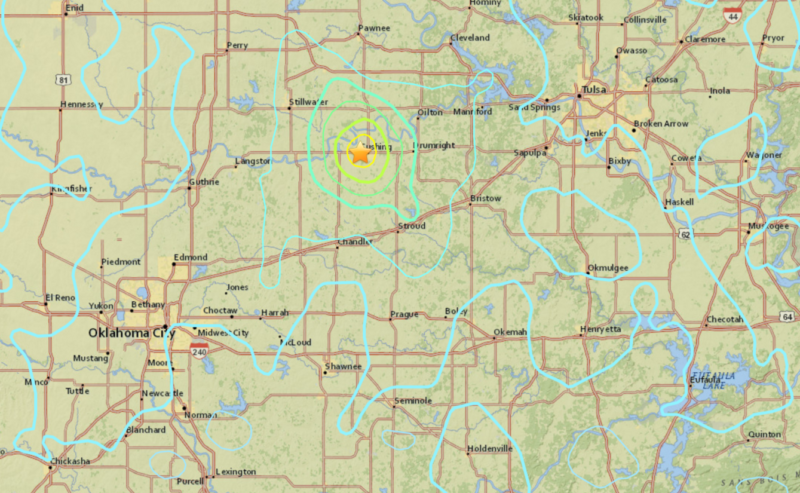 A magnitude 5.0 earthquake—one of the largest the state has seen—struck at about 7:45pm Sunday night near the small town of Cushing. It caused significant damage to more than 40 buildings downtown. Bricks came down from the outer walls of buildings, ceilings and roofs were damaged, and lots of windows were shattered, but luckily no one was seriously injured. Schools were closed yesterday, while the downtown area remains shuttered as building inspections take place. The Oklahoma Corporation Commission has been working on limiting injections in stages this year. The damage in Cushing will likely add to the calls to do more.